Teach Overseas job South America: TEACH ENGLISH IN CHILEAN PATAGONIA! TEACH ENGLISH IN CHILEAN PATAGONIA! Hi to all the adventurers interested in teaching English and discovering South America! 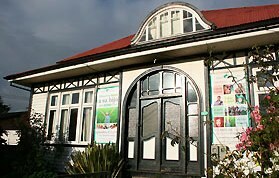 We are Idiomas Sin Fronteras, a language school situated in Northern Chilean Patagonia. We are currently looking for English teachers to work in our school in Puerto Varas starting ASAP until December 22nd 2017. We offer you a unique opportunity to immerse yourself in South America, to share your life experience with Chilean people, to get to know their traditions and customs, and finally, to be a part of a great and unforgettable adventure combining working and exploring breathtaking Chilean landscapes painted with volcanoes and lakes. - 40 working hours a week (including up to 25 teaching hours). - Commitment with a Second Language School that values education as a process and perceives the teachers as facilitators in this process. We provide our teachers with teaching material, we also provide guidelines and feedback on the lesson planning and class management. If you are interested in our offer, please send us your CV, a current photograph and a short letter explaining why you think that you will be a good fit for us. Enjoy an extraordinary and unforgettable experience in the heart of Chile.